Coach Gerry Friel is on my list of best coaches in America East history. 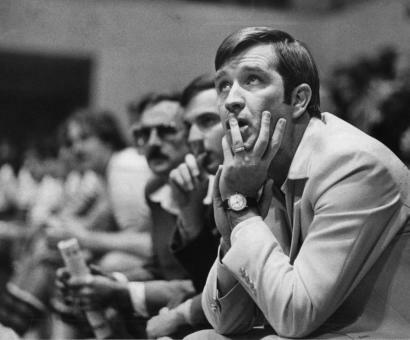 He was head coach at New Hampshire from 1969-1989, and his 188 wins is still the most in the 100+ year history of the program. After his coaching days he became director of university athletic relations and later served as director of athletic fundraising and associate vice president of the UNH Foundation. Sadly, he passed away in 2007. I had the pleasure of talking to his son Jeremy, who currently works as an assistant coach at Albany under head coach Will Brown. JT: In the late 1960s your dad joined the Boston College staff as an assistant under his mentor, Hall of Fame player Bob Cousy. The Eagles made it to the NCAA tourney in 1967 & 1968, as well as the 1969 NIT title game before losing to Temple. How did he like working under Cousy, and how devastating was the NIT loss? JF: Cousy was kind enough to speak at the “celebration” of my father’s life, where he said, “Gerard was like the son I never had.” My father and Cousy were very close, as Cousy helped get my dad his start in coaching at Boston College, not a bad guy to get your first job under! I used to hear stories about my father borrowing Cousy’s Cadillac to make recruiting trips. There was one time when my father got stared down in Madison Square Garden by Army coach Bob Knight after he got excited about a big basket by Boston College. Knight even confronted him in the tunnel after the game! My dad would show us the house he lived in right off campus in Newton. He ate all his meals with Cousy and his wife Missie in the BC dinning hall. My father grew up attending “Camp Graylag” every summer in Pittsfield, NH, which is where he first met Cousy. After being a camper at Graylag, my dad eventually became a junior counselor and then a full counselor, and that is where their relationship really started. My father used to demonstrate the drills that Cousy used at the camp. They were also tennis partners. My father did not really discuss what it was like to work for Cousy, but I know that Cousy gave him the freedom to work and learn and helped him get the UNH job, which is where he ultimately met my mother. Your dad used to have to pay for a parking place at the NH gym even though he was the coach of the team that played there. How was he able to support your family on a coaching salary from such a penny-pinching program? My father never did it for the money: he loved his job because he got to teach the game he loved and see young men improve as student-athletes. He was big on the little things and was always proud of the young men in his program being the student first in “student-athlete”. My mother taught PE/Health and also worked as a waitress. “Hand-me-downs” were the norm in our family, but what we lacked in money we made up for in love. My dad also had to teach a course called the “theory of coaching basketball” on Mondays/Wednesdays because it was part of his salary…but it was a very small salary. In 1983 he was named ECAC North Atlantic COY. What did it mean to him to win such an outstanding individual honor? I think if he were here today he would tell you that it was his players who won him that award; all of their hard work paid off and they did it the right way by not cutting any corners. He was proudest of his players graduating and becoming successful after college. Those were many of the same lessons he taught us. After stepping down as coach he served in several administrative positions with the school such asdirector of athletic relations, director of athletic fundraising, associate vice president of the UNH Foundation, etc. Why did he decide to stay at NH after stepping down as coach, and how did he like working in administration vs. being on the sideline? He decided to stay because he loved Durham, loved the community, and knew it was a great place to raise a young family. To top it all off, he STILL loved New Hampshire and all the relationships that he had built. He used to always say, “You gotta go where they know you”, and he was both known and comfortable where he was. He got paid a lot more in the other positions, but was always known as “Coach”. He remains the all-time winningest coach in New Hamshire history. What made him such a great coach, and do you think that anyone will ever break his record? I think what made him a good coach was that he truly cared about each and every one of his players. He looked at them all like they were his kids. I have also been told that even though his teams may have not been the most talented, they were the most prepared and played extremely hard. It is going to be tough to beat his record: it took him 20 years to do it, and these days not many people stay that long or are given that much time at a school. I hope it gets broken because then that probably means that New Hampshire basketball is doing very well, which is all that my father would have wanted. In 2006 he was inducted into the New England Basketball Hall of Fame: where did that rank among his career highlights? He was inducted as a “contributor” to the game of basketball. I am sure that he would have rather have been inducted as a coach, but he was happy to be recognized for the commitment that he had made. Both you and your sister Jennifer played basketball at UNH, your other sister Jilliane is currently a senior on the team. Your brother Keith played at Notre Dame, and your other brother Gregory played at Dartmouth. Do you credit at least some of your success to genetics, and who is the best athlete in the family? UConn assistant coach George Blaney used to tell us that my father was “the best 16 year-old he had ever seen”. My father used to say that he peaked too soon. He went to St. Bonaventure when they were winning NIT games in the 1960s, but after getting mono and becoming homesick he transferred to Oswego State. Keith is the best athlete and purest shooter, he is still playing for the Rochester Razorsharks in the Premier Basketball League. I have to give credit to both of my parents, we got our height from our mother Joan’s side of the family and our quickness from our father! You are currently an assistant coach at Albany, what did your dad think of your decision to become a coach, and what do you hope to do in the future? My father was excited and happy for me to test my career as a basketball coach. Without the support of both him and my mother I would not have been able to come to Albany and get started. They really sacrificed a lot for me to get to where I am today, and I owe them a great deal. He always told me to never lose my morals and ethics while coaching college basketball. Your dad passed away in 2007, when people look back on his career, how do you want him to be remembered the most? I hope he is remembered as a loving husband/father first, a wonderful person second, and a great ambassador of the game of basketball that he gave the majority of his life to. He talked about many of life’s lessons through the game of basketball, and truly loved the friendships and relationships that the game gave him. Jim Mahern OCHS - Class of '61. I played high school basketball with Gerry Friel. I played against him in a junior high school league. I agree with coach Blaney. I still tell people that he was the best player I have ever seen at that age. He had a hook shot (yes hook shot!) from the corner that was unstoppable. Maybe he did peak too early, but he sure was a pleasure to watch and play with, especially from my spot at the end of the bench for most of the game!